The summer between my first and second year of graduate school, I was asked to take a TA class. As a graduate student we were often assigned to help a professor, and those responsibilities could include grading papers, or anything else they needed help with. We needed training. One of the very first things they taught us was to AVOID THE RED PEN. They taught us not to use a red pen when we were grading papers or assignments. They suggested that any other color, even pink or orange would be better. They went on to teach us how a red pen immediately puts someone on the defensive. It makes the mistakes stand out over the things the student might have gotten right. This discourages the student. The color itself makes us feel negative. They also taught us that when grading a paper, we should always try to SAY SOMETHING POSITIVE FIRST, before we made a negative comment on what we were grading. Not only have these principles helped me as a teacher, but they have also helped me as a parent. They can help all of us. 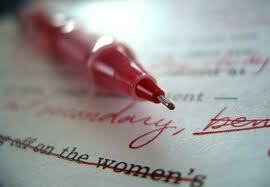 AVOID THE RED PEN- don't constantly point out our children's shortcomings. We don't need to spend all our time with our children pointing out what they are doing wrong or need to do better. Sure, there are times when we need to, but not all the time. Don't be nit picky. Constantly pointing them out is like using a red pen instead of a blue one. Our kids grow up with their mistakes glaring in their face. That is discouraging, and immediately puts them on the defensive. And, it makes them feel like doing something good won't matter, because all we point out is the bad. This also means that we don't point out their mistakes to others. Use a blue pen, make the bad less obvious and praise the good. SAY SOMETHING POSITIVE FIRST- When we talk to our children, always start with a positive statement. Then you can follow it up with the problem. Sometimes the only positive we might have to say is "I Love You". That's okay. Don't let yourself say something negative or reprimanding until you have said something positive. Our goal should be to make 90% of our conversations with our kids POSITIVE. With only 10% negative, reprimanding, and correcting. Evaluate how you are talking to and "grading" your kids. Are your conversations filled with red pen? Do you follow the 90/10 rule? These simple principles will strengthen our relationships with our children, and we will find that they will be better behaved. What color pen do you use? Do your conversations follow the 90/10 rule? I love this. I probably use way too much red pen in my conversations with my kid. Thanks for the tips, I really need them. I am pretty sure I use these tips more as a parent than I ever did as a TA. I am always reminding myself to switch colors. When I am really tired I find I reach for the red first. Yikes.